Modern Cozy: Happy New Year! Good Morning! Hope everyone had merry and bright holidays - I didn't mean to be away so long but we had a busy December and with the space between Thanksgiving and Christmas feeling exactly as long as a blink it just happened. I have been posting bit and pieces in Instagram since it's so fast and easy :-) come follow me over there if you haven't already, I'm darcychildress on IG. - To use the Stash I already have! - Finish UFOs without distraction by shifting to other new beautiful fabric. - Stop the insanity of constantly buying the latest and greatest fabric. - Save the $$ I spend on stashing. - Destash the fabrics that I realize I am never going to use. 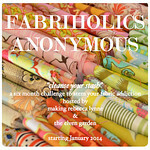 1) No fabric purchases for 6 months beginning January 1, 2014. 2) At 6 months reevaluate status and decide whether to keep going for full year. Evaluation July 1, 2014. 3) Create a UFO list and complete them! Backing: purchasing a backing to finish a quilt top is permissible. However, attempting to use fabric in your possession for a backing is preferable. Books and Magazine purchases are allowed as they are not fabric. Notions acceptable too. Swap Mama Fabric: if hosting a swap you are permitted to by fabric to execute swap duties, but you may not join a swap simply for the sake of being able to buy fabric! Quilts for Publication: if you are making a quilt for a publication and need certain fabric to execute it correctly then that is a major exception - who can blame you? LIzzy House tone-on-tone pearl bracelets (This is my own personal exception because I know I want them. Can't help it. Trying to keep it real ;-) I'm also planning on sharing any fabric purchases on the blog, trying to keep myself honest! It is SO easy to get caught up in all the gorgeous, amazing fabric being released but the problem (for me anyway) is that I am constantly adding to the "to sew" list and rarely finishing anything. Combined with my mommy-schedule and precious little sewing time it just makes for a gorgeous stash but few completed projects! Shopping for fabric is my stand-in for having time to sew. It feels good and like I've accomplished something but it's not real and I end up feeling more frustrated with myself than anything else. So more creativity and actual making in 2014! Yay! So my personal goal for 2014 is to work through my backlog of sewing projects without continuing to add new projects. I've been making my list of projects that are either in progress or that I've bought fabric for and it's embarrassingly long. I'l share my list with photos next week - seems like a good way to get organized and hold myself accountable. The other part of my goal is to save money for a new sewing machine, a Juki. Because I hate to leave you without and fun fabric shots here's my first project for 2014, a mini quilt for my cupboard using some of my precious Liberty rainbow pack from Purl. These were 20 fat eighths (9x12) that have been sitting on my shelf for literally years. Seemed like using this precious fabric to make something lovely would be a great way to kick my year of using the stash. It made me extremely nervous to cut into it (silly, right? but true) but I'm trying to be brave. Hope to have it finished next week with a shot of January's cupboard for you! Thanks again for joining me here and happy New Year! Good luck with the fabric fasting. It is fun to shop the stash though. Happy New Year! I'm with you. With all the stuff I have on my shelves I don't really need to buy anything this year. Want to get my stash down some so that I have an excuse to buy more! I too have some lovely Liberty of London that I just purchased before I went on my fabric diet. I have in mind a pink colorwash hexie quilt. Love the fabrics. Swoon. I totally understand the trepidation cutting into such loveliness, but having a useful and used piece will make it all worth it. Love the shop your stash idea. I have a sewing business, so it might not last, but I'm certainly trying to use what I have first. Makes the hubby and the wallet much happier.